Some baling machines even come with the added feature of moisture extraction to remove residue that may be leftover. Cardboard, plastics and even metals may have been used as containers for liquids that leave traces on the material when it is going through the recycling center. 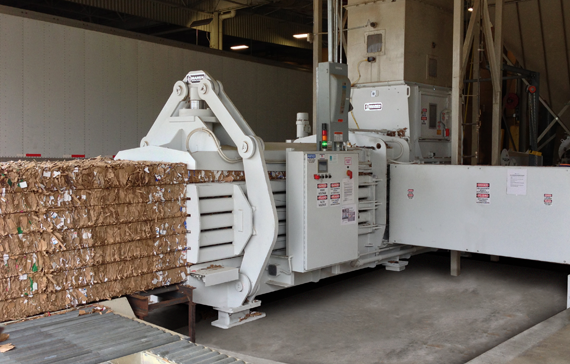 Moisture extraction ensures that the bales are dry when they leave the facility. To begin creating a bale, a high volume of material is loaded into the input area of the machine. From this area, the material is led into a compression chamber where it is crushed and formed into a cube. Most balers are powered by electricity, but they use hydraulic power to compact and push material because this allows for a strong and consistent compressive force. After compaction, wire or strong plastic ties are then bound around the bale to hold it together while it is moved. Some balers can even be adjusted to create custom-sized bales. Since the bales are so heavy, a forklift is used to lift them and stack them or drive them directly onto a truck for shipping. A vertical baler is a baling machine which utilizes a vertically oriented ram to compact recycled materials. 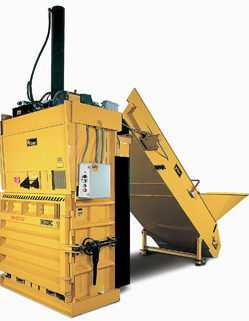 Materials can be loaded in a variety of different ways, but most vertical balers are loaded through a large compartment on the front of the machine, which is then closed during operation. Since they are vertically oriented, they usually take up far less floor space than other baling options. They are usually less expensive as well. Vertical balers are most commonly associated with cardboard baling, but they are capable of baling many different types of recycled materials and can be customized to fit specific requirements. Horizontal balers are balers equipped with a horizontally acting compression ram. This kind of baler is usually much larger than a vertical baler but has the added benefit of handling larger quantities of materials at one time and can even operate continuously. Horizontal balers can be fed manually or can be equipped with automated systems like conveyors and feeders to continuously feed materials into the compression chamber. Applications which handle high volume recyclables usually take advantage of horizontal balers as they provide greater material handling efficiency. 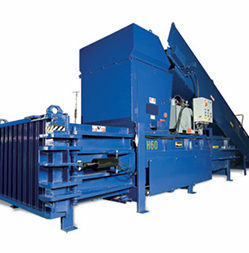 These balers can also be designed to handle practically any recycled material, from paper to metals. A two ram baler is a style of horizontal baler which uses two horizontally oriented rams instead of just one. These balers are typically fitted with larger hoppers and feeding mechanisms, so that they can more quickly feed material into the compression chamber. With two rams, the baler can effectively compress bulkier materials and larger quantities of materials. 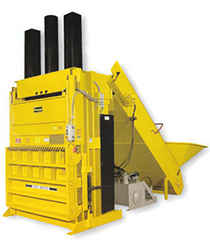 In some cases, a two ram baler can eliminate the need for shredding, pulverizing, and other conditioning processes. In general, two ram balers allow recyclers to process more material, faster. However, since they are using two rams, they do require more room and more power.